We offer classes for every age and every fitness level. No experience? No problem, at Aerotique we believe anyone, at any age and body can have fun enjoying the circus and aerial arts. Welcome to Columbus's very first Bungee Workout. The bungee beginner workout is the perfect class to learn all about the bungee basics. Bungee beginner puts the flyer into a harness with a bungee system behind them. This allows for movements to be more effortless and fluid with very low impact to the body. This class will be more about teaching the developmental skills and then putting them all together into a sequence at the end. Bungee beginner is sure to have you sweating and having a great time. Ready to take your bungee to the next level, try the 60 minute Bungee dance class! 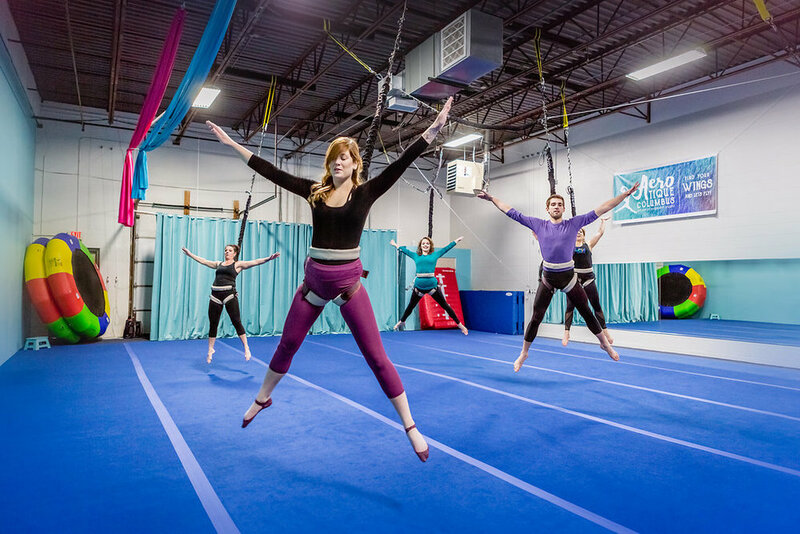 Come explore the world of aerial arts in one of our classes. Challenge yourself in a new and exciting way and build strength and confidence in the process. 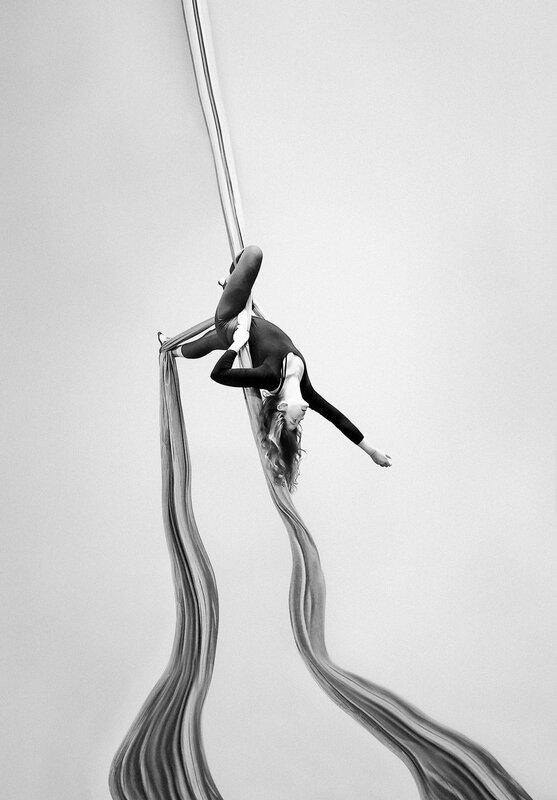 Aerial classes include silks level 1, trapeze level 1&2, mixed aerial and aerial conditioning and strength training. Bring your child to Aerotique to experience the circus arts. 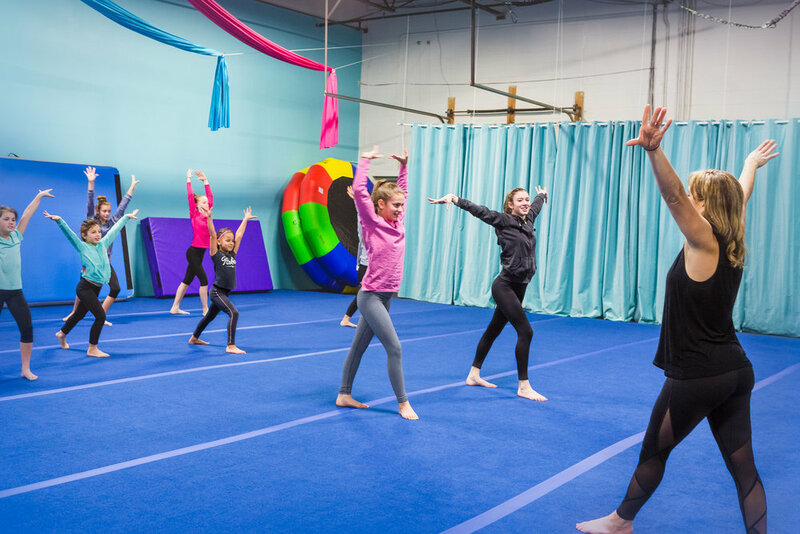 In this class your child will learn the basics of everything Aerial from the low flying trapeze, to the silks, and rings. If your child loves to climb and be upside down, then this is the perfect class! Classes are designed in a way that will teach participants in a safe and progressive way on various aerial apparatus'. 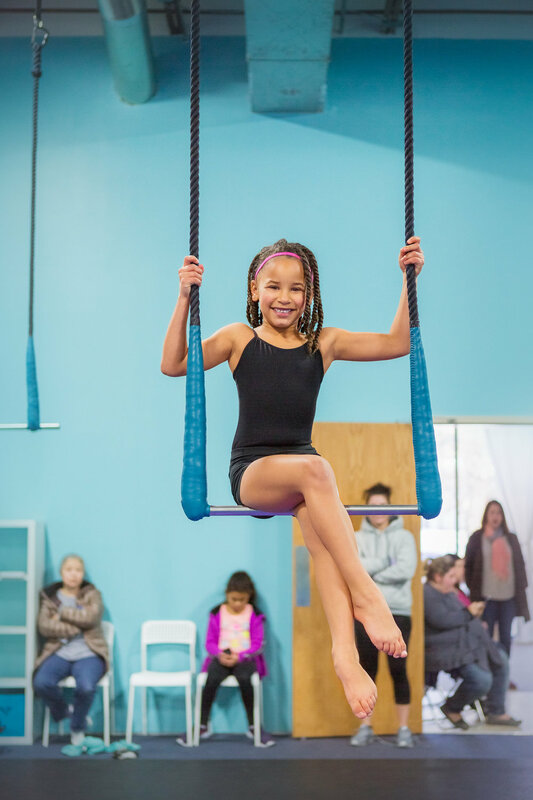 Kids can take an aerial silks class, trapeze class, or even a mixed aerial class where they will do a little of all aerial skills. Get ready to tumble your way into a stronger you! In this class you will begin with a warmup designed to practice flexibility, strength and balances. Structured tumbling passes will be practiced along with fun partner acro poses and formations. Time will be reserved at the end to practice specific skills or condition. This will be the best hour you've ever spent getting fit! This class is guaranteed fun! 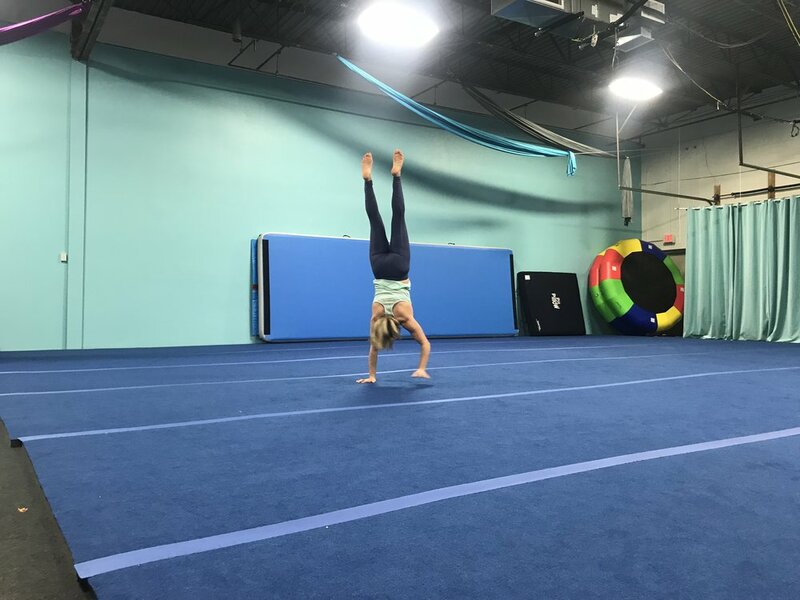 In this hour of circus fun, we do anything from jump on the aitrack, tumble, partner acrobatics, work on handstands, flips, and anything else that puts us upside down and in motion through the air. 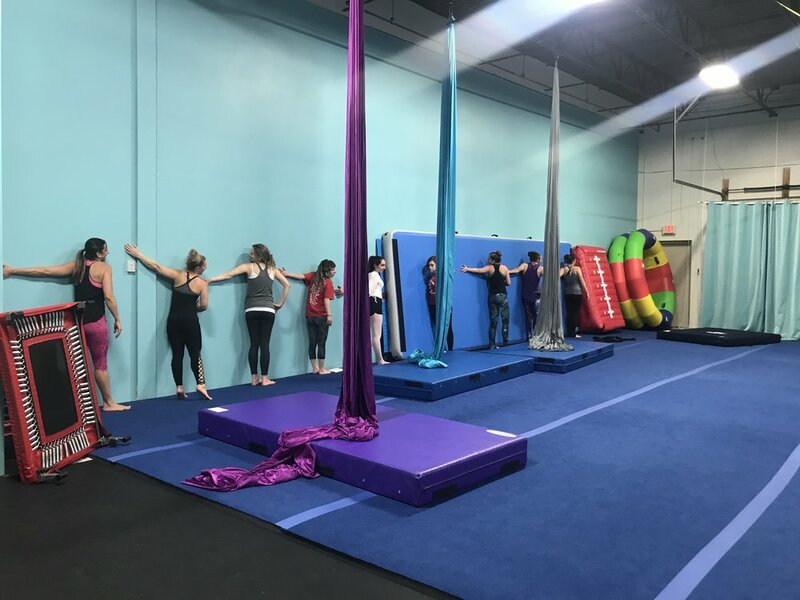 At the end of the class get ready to try the low trapeze bar or silks and test your strength! You might find your're circus bound! Get ready to fly, invert, swing, lift and burn some major calories. This class will move fast and be jammed packed with everything Aerial. pull ups on the trapeze bar, rope climbing, handstand holds, leg lifts, chin holds. Get ready to be the strongest form of you. Calling all circus kids! Get ready to fly, swing, go upside down and all kinds of circus fun! Class will begin with a fun music filled warm-up, then circus kids will practice their best acro and tumbling skills. Participants will get a chance to try their skills on the trapeze and silks every week too! Calling all circus tots and parents! Come roll, flip, swing, invert and have a great time with your little one. Get ready to show your child that its fun to go upside down and swing around…or maybe they will show you! 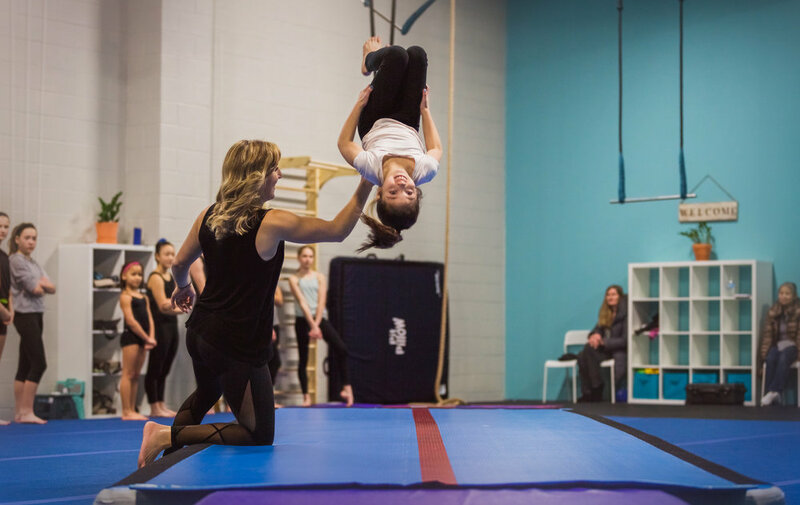 Swing on the low flying trapeze, climb the wall into a handstand, cartwheel, roll and have fun! While class will provide a portion of structured class, it is very important that a parent is supervising the child at all times. Both parent and child are guaranteed to get a good workout and have fun!